Frigidaire FFAD7033R1 70 Pints Dehumidifier is one of the best sellers and called one of the best dehumidifiers on the market. It works very efficiently and quickly, it is quiet, extremely durable, and very flexible. It will work in areas up to 1300 square feet (120 square meters). The FFAD7033R1 is modern looking sleek and slim design dehumidifier made of high-quality materials. A great feature is tank window ring. The display is placed on the top of the unit. It has a modern feel and design. A dehumidifier is portable, it is equipped with easy-rolling caster wheels and a top carrying handle. Very easy to move the unit from space to space. Plus, manual and continuous drainage make it more flexible. Just pick the right draining method for the space at hand. The FFAD7033R1 weighs 47 pounds (21 kg) which are close to competitors weight. Height x width x depth is 24 x 15 x 12 inches. Frigidaire FFAD7033R1 is equipped with many features. Humidity control. You can choose a value between 35% to 85%, so the room is maintained at a comfortable humidity. Humidity can be set in 5% increments. After you set the desired humidity, the display will show actual room humidity. The FFAD7033R1 has 3 fan speeds – high, medium and low. A higher fan speed will result in faster moisture removal. The “Compressor” circuit has an automatic 3 minute time delayed start if the unit is turned off and on quickly. This prevents overheating of the compressor and possible circuit breaker tripping. The FFAD7033R1 has a clean filter light which will illuminate after 250 hours of use. Timer enables you to set start or stop time. You can set any time in the choice from half hour to 24 hours. Full tank alert system will notify you when the tank is full. The FFAD7033R1 have also added an extra bucket full indicator light to the front of the unit, this light will constantly blink when the bucket is full, removed or not placed accurately. The dehumidifier has an auto shutoff function. The unit shuts off when the water tank is full saving energy and protecting against spills. If the FFAD7033R1 goes out due to unexpected power off, it will restart automatically with the same settings as before. Low-temperature operation. The unit is designed to operate between 41 °F (5 °C), and 90 °F (32 °C). The unit will not work well if the temperature is out of this range, or the performance of the dehumidifier will fall greatly. Auto defrost automatically decreases frost buildup so the unit can continue extracting moisture in low temperatures down to 41 degrees F.
Continuous drain option is available. The drain hose is not included but you will have drain hose adapter in the package. If you want to drain moisture upward you will have to add an external condensate pump. At close distance, the Frigidaire FFAD7033R1 produces 61dB of noise on high fan speed and 57 dB on low fan speed. That is less than most competitors in 70 pints size class. At long distance, the Frigidaire FFAD7033R1 produces 53 dB of noise on high fan speed and 49 dB of noise on low fan speed. That is very close to competitors noise. Clean the filter every two weeks if you use dehumidifier every day. Filter removal is an easy process just pull the tabs and then take out the filter. The filter should be washed with clean water and then dry it without using any fans or dryers. Water bucket for 70-pint dehumidifier is small and you have to clean bucket regularly with warm water and detergent. Frigidaire FFAD7033R1 provides budget-friendly and energy-saving operation. This model is energy star qualified. On max fan speed, it uses 745 watts. Frigidaire FFAD7033R1 70 pints dehumidifier is an excellent moisture eliminator. It has a lot of features, it works quickly and efficiently. Click to See the Price! Visit my blog for other dehumidifier reviews! 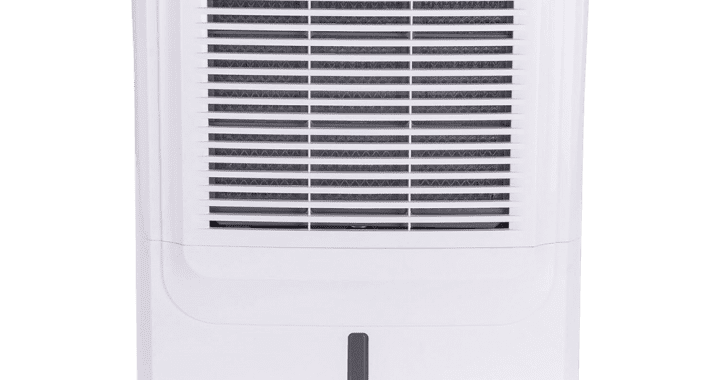 Read my full dehumidifier buying guide here. See Indoorbreathing dehumidifier comparison charts. (Dehumidifiers by price and pints). Posted in Dehumidifier Reviews, Reviews and tagged 70 pints dehumidifier, Frigidaire FFAD7033R1.